Leonard Gross, the owner of a waterfront property, sought to build a four-floor, 14,273-square-foot, 23-room hotel. The Bayville Village Board on Monday repealed portions of its zoning code that would have allowed a four-floor seaside inn to be built. Arthur Kremer, an attorney for the owner of a waterfront property seeking to build an inn on the former Steve's Pier property on Bayville Avenue, told the board during public hearings before the vote that the village could face a $10 million lawsuit if it repealed the code allowing the construction. More than 60 people attended the hearings for the repeal of two sections of zoning code that permitted seaside inns. Mayor Robert De Natale said he was elected earlier this year because the public had rejected the earlier measure championed and passed by the previous administration in 2016. “Everyone on this board was elected because of their position and their promise to repeal that legislation,” De Natale said after the vote. During the hearing De Natale said the board had met with the developer two weeks ago about the project but was "not at liberty" to give details of those discussions. "We promise we will not approve something to be built on this site ... without very careful consideration," De Natale said. "We do realize the owner has a right to build and we will guide him to build the right thing." Kremer, of Uniondale-based Ruskin Moscou Faltischek, represents Leonard Gross in his proposal to build a 14,273-square-foot, 23-room hotel. Kremer said Gross had spent money preparing the property for development — including putting in a foundation — after negotiations with previous administrations. "I’ve never seen a resolution like this which takes away due process, equal protection under the law, and basically says to somebody’s investment 'you’re out of luck because we want something different,' " Kremer told the board. Village Trustee Robert Nigro challenged Kremer on Gross' past proposals for the site, including a spa that was approved but stalled after the foundation was put in. "What did he do with the foundation after he built it? Nothing," Nigro said. 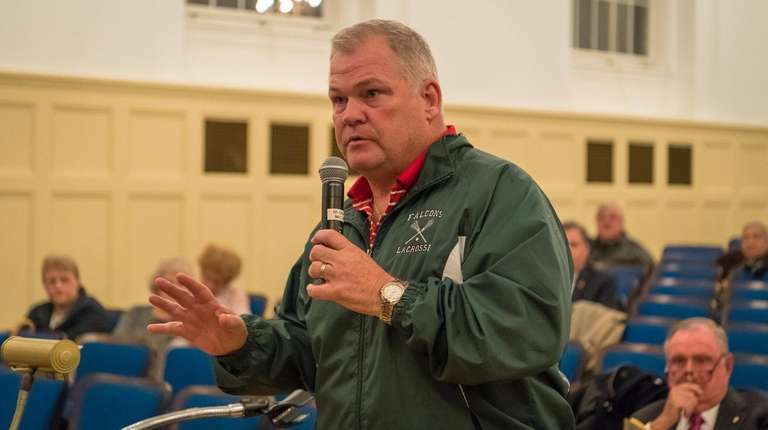 .Former Mayor Paul Rupp, who had supported a seaside inn as a boon to local businesses and did not seek reelection this year, urged the board to not repeal the code "because it would be a big mistake and set this village back a long time." "Putting in a beautiful building, I don’t see how that hurts anybody," Rupp said. Another former mayor, Victoria Siegel, urged the board to repeal the zoning language. "If a seaside inn were to come before the board ... the board may consider and make a decision one way or another," Siegel said. "But to have it in the zoning, is by matter of right, there is no discretion, there is no flexibility."